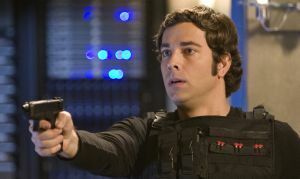 Chuck appears to have taken Cole's advice and is now carrying a gun. Looks like someone tranq-ed Casey in the command center. Casey's got something that Chuck wants. 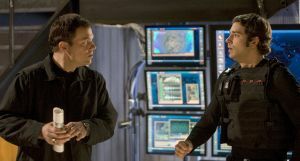 [Might that be Chuck's Intersect scematics that Casey's holding? 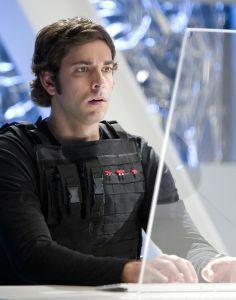 Chuck working a computer in Fulcrum's base[?]. Ted Roark, Chuck's dad and the Fulcrum assassin.